My sweet angel Easton.....what a joy.....he has a peace and calmness about him. I love him so much. He's now 7 weeks old (above pictures also) My heart smiles thinking about him. In the above picture he's 4 weeks old. I took a picture of him next to my foot so you could get an idea of his size. Sweet little boy. He's grown so much in the last 3 weeks though. His shirt says, mommy loves me. It's true. I look at these pictures and want to squeeze and kiss him. He's so adorable. Can't you just see the sweetness oozing from him. 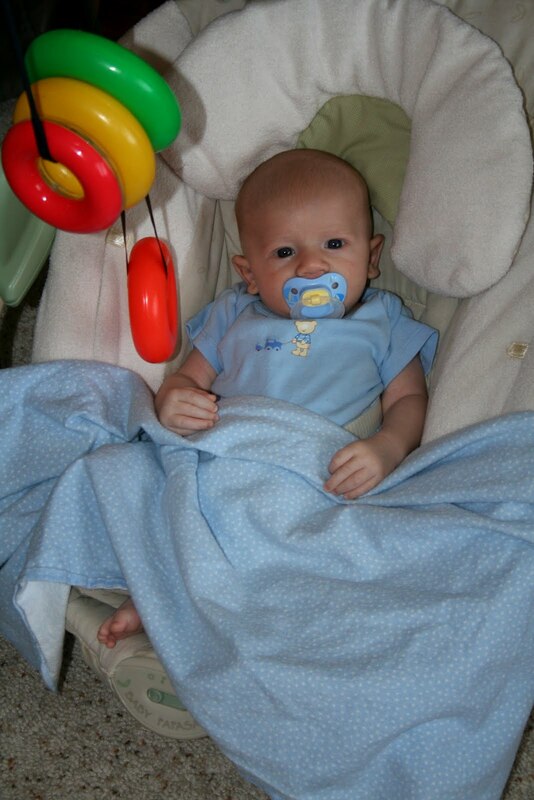 The above picture is of Easton sometime in his first week. I love it with his leg like that. Just like in my tummy I'm sure. Also, notice the prominent ridge on his head. We had to take him to get an X-ray because my doctor was worried that it had fused together too tight and wouldn't move to allow brain growth because when he pushed on it, it was really solid. We had the X-ray and everything was fine. The ridge is gone now. He still has a pretty cool looking one on the back of his head still. Cutie buns and toes! I love their little frog legs. So fun to have them snuggle like this on your chest. I love that. I also love how Easton has this little patch of longer hair on the back/bottom of his head that sticks out. When I'm holding him up on my shoulder. I can look over and see it, makes me smile every time. What a cutie! Isn't it great being a mommy?